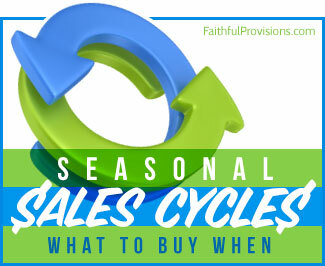 Every year we make a few small changes, or big ones, depending on how things pan out. But that is one of the MANY things I love about homeschooling. Every year is completely different! I now have a 10 year old 4th grader and a 7 year old 1st grader and with a 13 month old it can sometimes be a little bit of a challenge. Wow! Did I just say that? 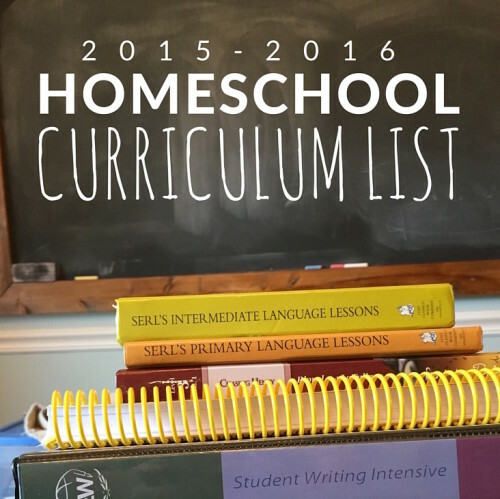 We are starting our sixth year of homeschooling and the years have absolutely flown by. I am learning that each day is unique and will not look like yesterday, but there is one thing that is constant. If we start our day with the Lord, it is never a failure. I want to encourage you, that if you get nothing else done in your school day, start it in prayer and worship time with the Lord. He really does bless your worship and praise of Him, a thankful heart will change any day around. I love to post little snippets about what our days look like on my Instagram feed, so please head over and join me there. The goal there is to encourage and give you ideas, not to compare each other. Remember, when you see a picture of us on social media, you are seeing only what I show you and sometimes it might be the only good looking part of our day! Can anyone relate? I just finished reading a fabulous book that has helped refocus and reenergize me for the year ahead. R.C. 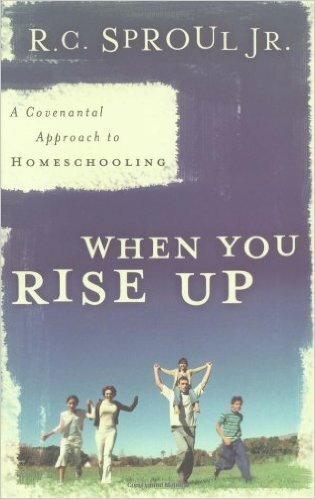 Sproul Jr.’s book When You Rise Up: A Covenantal Approach to Homeschooling might just be one of my favorite homeschool books of all time. His reminder is simply this… education is discipleship. When it comes down to it, we don’t homeschool to raise academics, we homeschool so we can raise disciples. If you need a little encouragement, and emotional direction to start your year off, I want to urge you to read it! Other than math and language arts, I try to do our school work together, which makes things so much easier. History is done online together during lunch, and their Spanish is done separately. To start our day off around the breakfast table we start with our memory verse recitation, Draw to Learn Proverbs, and then move to reviewing our English from the Roots Up Flash Cards. While they are drawing their Bible, I usually do a quick math flash card review for each child, to keep them sharp! After we finish our circle time together, the kids split up to either do their one on one time with me or complete their independent work. Since my 4th grader is doing primarily independent work at this point, she usually heads off to do her work and my first grader and I head to the school room to do our seat work. It is a schedule that is working very well for us so far. This year my kids will be starting a Charlotte Mason-based type of tutorial at a friends house with 15 other kids, two days a week. They will be covering mostly Science and the Arts in an outdoor environment, only being inside for severe weather! They are so excited about this and so am I. Critical Creative Thinking – The children will have instant challenges (technical and performance based) to solve each day and will be working toward their main semester projects. Tinkering Garage – This will be a time where the children will be working in the garage with all sorts of different materials like wood, pvc pipe, carpet samples, yarn, nails, power tools (with supervision), hammers,etc. It will be a time for them to create and build! Art – Artists include Faith Ringold, Rene Magritte, Renoir, Jackson Pollock, Paul Klee, Winslow Homer, Grant Wood, and Picasso. They will study the artists life, art work, and mediums. Botany by Apologia – they will be on 5 acres of forest and will be growing their own gardens! *They will have loads of time outside with hands-on studies including seed collecting, nature journals, and dissecting flowers. Draw To Learn Proverbs – We did Draw to Learn Acts last year (and are still finishing it up!) and it is my favorite way to learn the Bible. It is simple and allows my children to dig deeper visually, to use their talents and be interactive in our Bible time. *If you have multiple kids, it is better to buy the eBook and go to your local office supply store and get them spiral bound for around $5. *we will actually read this at night for our family/Bible time. Historical Literate Read Alouds with Program: Black Ships Before Troy, The Bronze Bow, and others on the Veritas Historical Literature Guide. * We ditched Latin into the first semester last year and started these and they are wonderful! Rosetta Stone Spanish — This is a video curriculum that I think will be quite helpful to keep up with as they get older. No matter my kids age, I feel that to create a love of reading they need to see it modeled for them. We have read consistently to our kids from a very young age, and both love to sit and read on their own. But our favorite part of the day is sitting and reading together. Usually while I am reading, they are keeping their hands busy doing things like playing Legos, drawing art, doodling, knitting or even sewing. I find that if they have an activity to do with their hands, they actually listen better! 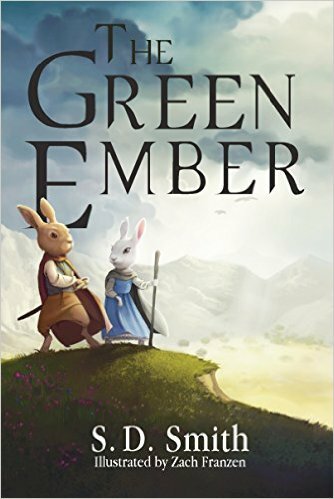 The Green Ember – we are absolutely loving this recommendation by the Read-Aloud Revival, my new favorite podcast! If you have an Amazon Prime account and a kindle, you can borrow this through your Prime account for FREE through the Kindle Lending Library! The Black Star of Kingston – book 2 in the series! The Wanderings of Odysseus – anything by Rosemary Sutcliff is amazing. My son is starting 1st grade this year but he is doing work on a 2nd grade level since he is an older first grader. He gets the bulk of my time, which is usually the case until they are in 3rd or 4th grade! 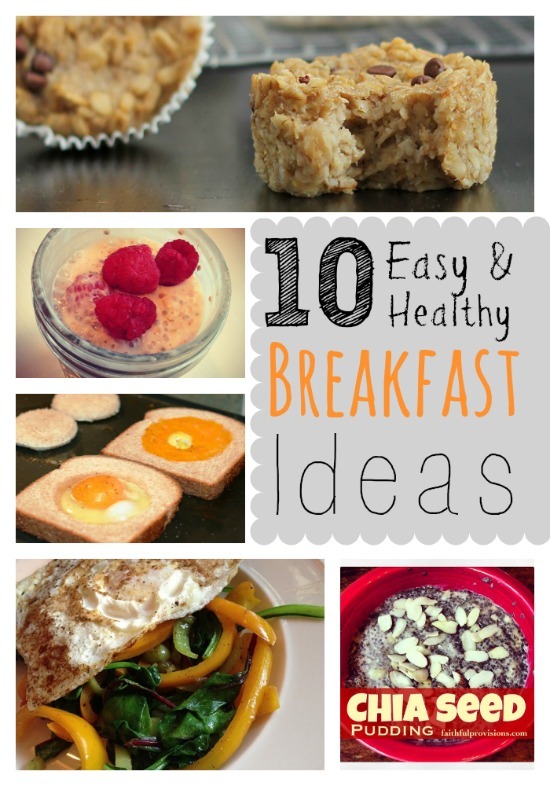 Here is a comprehensive list of what I plan on using, but this could change! All About Reading – Level Three – this is hands down my favorite reading program ever. Primary Language Lessons – I have really enjoyed doing this with him each day, it is a very gentle Charlotte Mason style introduction to grammar and language. Be sure to get the Teacher Guide to go with it! Pictures in Cursive Primer (Daily Cursive Writing Instruction Based on Picture Study Lessons) by Sandi Queen — I have laminated these and he uses a wet erase pen to trace and practice during his independent time. Primary Journal – We use this daily to learn new vocabulary words, create a sentence with them and then draw a picture. I keep it super simple, but it is a way to transition him to following directions, staying on target and becoming more independent. Boy Scouts – I have a little Wolf Cub now! Piano – Free Lessons using Hoffman Academy, he was playing a song after the first lesson! Since my 4th grader has started the school year, I have found that her level of independent work has way exceeded the one on one teaching time she needs with me. Most of our time together now is just reviewing her work and me being available to her anytime she needs any help. It has really flip-flopped our days. It is a good thing, because I feel less stressed to get things done, but I have to admit, I really miss our face to face teaching! * I haven’t decided yet which I am going to move forward with, I am trying to free up a little of my time and this will give me an extra 45 minutes to have with them to read and snuggle! I absolutely LOVE RightStart Math program and will continue it with my 1st grader, it is just very teacher intensive. Institute for Excellence in Writing – Level A – She has absolutely loved this and has flourished in her writing in just 2 weeks. It is such a simple but effective introduction to writing. Being an author, I really wish I had gone through this! Intermediate Language Lessons – You will want the Teacher’s Guide to go along with this, but she can do about half of the lessons independently and then we just review what she learned together. Daily Grams – Grade 4 – my favorite part about this is that she is getting a sentence combining exercise every day and it is very helpful in taking her to the next level in her writing. All About Spelling Level 4 – this is a SOLID spelling curriculum and we just do about 5 minutes per day. Very effective and easy. Veritas Press Literature Selection and Comprehension Guides, Grade 4 – items below with an * have a corresponding comprehension guide and this is her favorite part about her literature program! These are on the list, but she will just see how far she gets. Piano – Free Lessons using Hoffman Academy, she has taken for 2 years and did Guild last year, so we will see if this is advanced enough for her. 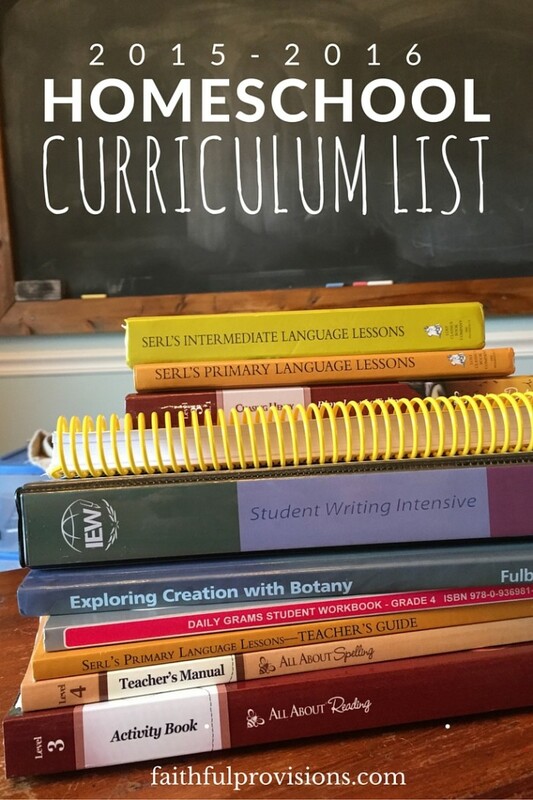 What does your curriculum list look like for this year? Got any tips for homeschooling two kids? Please share in the comments below!